As a DBA, it is important for all of us to get real time alert on various issues in our inbox to be more proactive and to manage the database servers in better way.There are many third party tools which you can easily configure to monitor the servers and to get the alerts. I feel more happy when we implement the required alert by our self to get the alert. we have implemented many custom alerts in our environment. I will share the important ones in this blog. There are many method that you can adopt to implement custom alert. I have done this using WMI (Windows Management Instrumentation) .WMI is very powerful one to monitor the performance of the servers and application. Blocking will happen when one process need to wait for a resource(example lock) which currently using by another process. The first process has to wait till the second process completes its action and release the resources. Let us see how we can set up the alert for blocking. 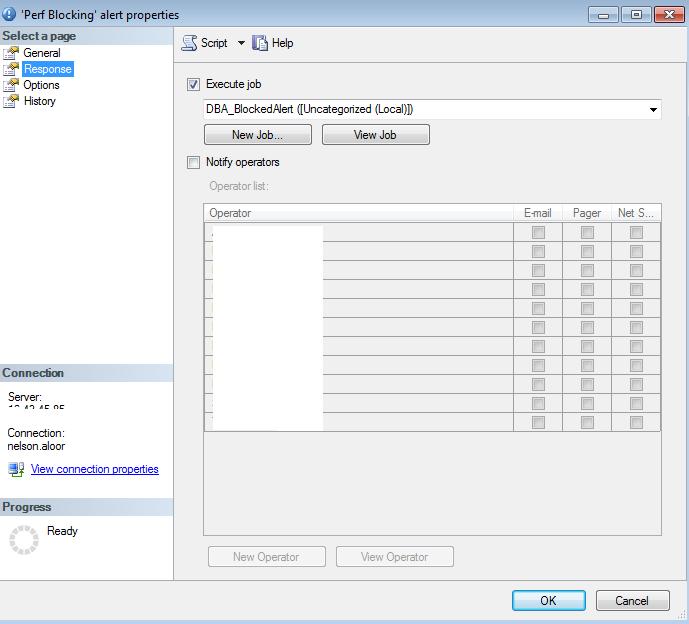 The first step to create blocking alert is configure the blocked process threshold values.This is server wide configuration which can be set using sp_configure.The value of blocked process threshold specify the threshold, in seconds,at which blocked process reports are generated.By default no blocked process reports are produces.In simple words, if the value configured as 30 second, we will get alert when a process is blocked for more than 30 seconds. This can be done using the below code. Another configuration change that we need to do in the SQL server agent. Right click on the agent node , select properties. On the left pane select Alert System. On bottom of that page tick the check box of Replace tokens for all job responses to alert. Read more about the this on MSDN.Restart the SQL server agent service. Replace the instance name with your instance name. In the response page tick the Execute job check box and select the job that we have created earlier. Now everything is set. 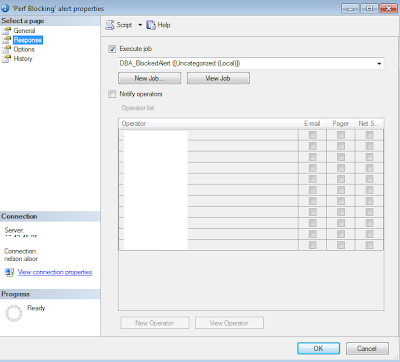 Create a blocking and wait for 30+ seconds to get the alert in your mail box. In case if your are not receiving the alert follow below point to troubleshoot. Check alert history and see number of occurrences. 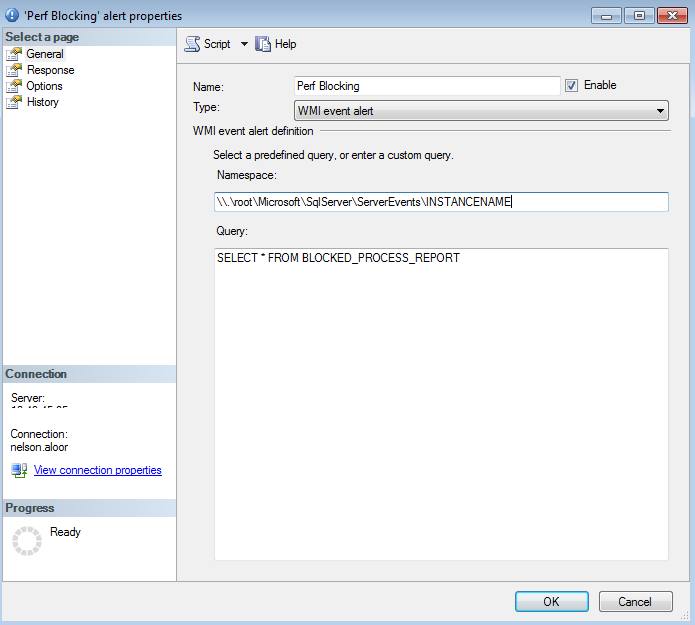 If it is still zero either blocking is not passed 30 seconds or there is some problem with WMI. Check your WMI service status. if it is running , restart the WMI service. If the number of occurrence is greater than zero, check the table BlockedEvents. If there is no entries, the token replacement may not be happening. Check the Replace tokens for all job responses to alert of SQL server agent properties. Make sure that you have restarted the SQL Server agent service after making this change. If there is an entry in the BlockedEvents table, there is something wrong with your database mail configuration /mailbox. Check the database mail is working and you have mentioned the correct profile name in the job step. 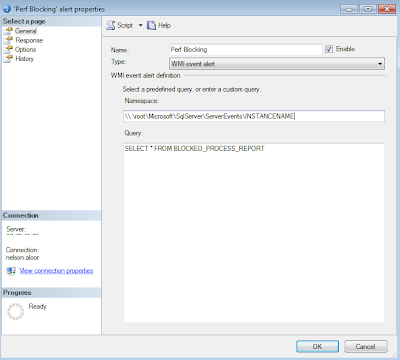 Hope this will help you to implement custom blocking alert in your environment. Can you please put script to create table & Job step. When I clicked on here link to get script it retruns nothing. Can you please provide script for that? This is really Nice, I tried for 30 mins (EXEC sp_configure 'blocked process threshold (s)',1800), but is not working for that 30 mins threshold. Is there any limit for the threshold, Please let me know any other way if I want to get the blocking alert if it is blocking for 30 mins. Thanks for you reply. I have already tested it for 30 and 60 seconds, it is working greatly. And also I have observed that if go for a threshold of 15 minutes (EXEC sp_configure 'blocked process threshold (s)',900) then I am able to get alert after 30 minutes which is abnormal. Very useful...I tried to put the entire code in the job as an stored proc with parameters like @EmailAlert (1- sends email, 0 doesn't), @Receipients, @ProfileName, but it doesn't seem to work, but if the entire text is put in the job it work...would like to know why ? The understanding of the ins and outs connected with system buildings requirements in which pros linked to SQL server jobs opportunities, will be able to comply with the reason from the movement connected with info throughout the system, because the SQL Server Careers will most likely require solving in addition to steering clear of bottlenecks that will damage accomplishing this. For some reason the alert keeps sending emails long after the the block has been cleared. The only way we can stop it is to disable the alert. Ideas? I tried it on SQL Server 2012. The alert works but I get an empty email, empty table and empty trace file. I set the threshold at 30 seconds. Please help! This does not seem to work on a database that has READ_COMMITTED_SNAPSHOT enabled. the alert registering for blocking events in all other databases OK, but nothing for RCS. If anyone has any insights into catching it, please share.